- The Heckster: first to do it at Swynie since ET. This bodes well. Surely? The 21.5.2016 was the happiest day of my life. I genuinely never thought I would live to see the day. To witness that; to physically be there, with my Dad and my brother compensates for all the disappointments and the ignominies. People will talk about that game for decades. Ahh the penalty that made a man disappear. Won by Lewis Stevenson's determination to keep chasing what seemed like a lost cause. I reckon the win on Saturday, including the shift in attitude, tactical changes and atmosphere does bode well. As a club it’s important we keep progressing, evolving and stay as focused as Lewis Stevenson has his whole career. 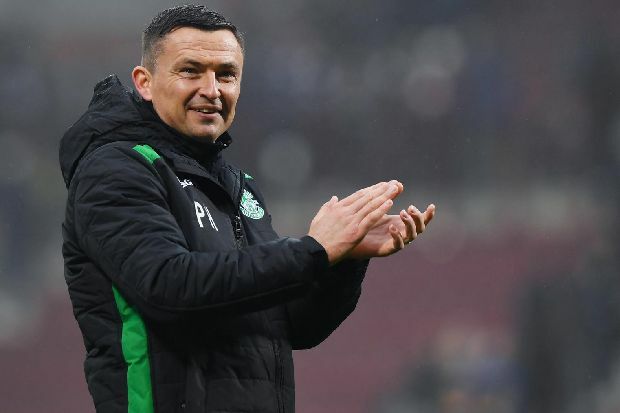 Hibs' win at Tynecastle on Saturday took Paul Heckingbottom unbeaten start to his league career at Easter Road to eight. I reckon we should get pished in Belfast again! I'm so glad you're back Seven Tattoos; this bodes well for the future of the bounce! I'll try not to post pished again.